Although when I originally started Angry Pear I was very adamant about NEVER drawing anything but pears, I have since decided that some things (irritations and annoyances mostly) just can’t be expressed with pears. Or, I guess I should say, they cannot be expressed clearly enough with pears. So I have decided to occasionally post a comic or drawing that isn’t a pear. 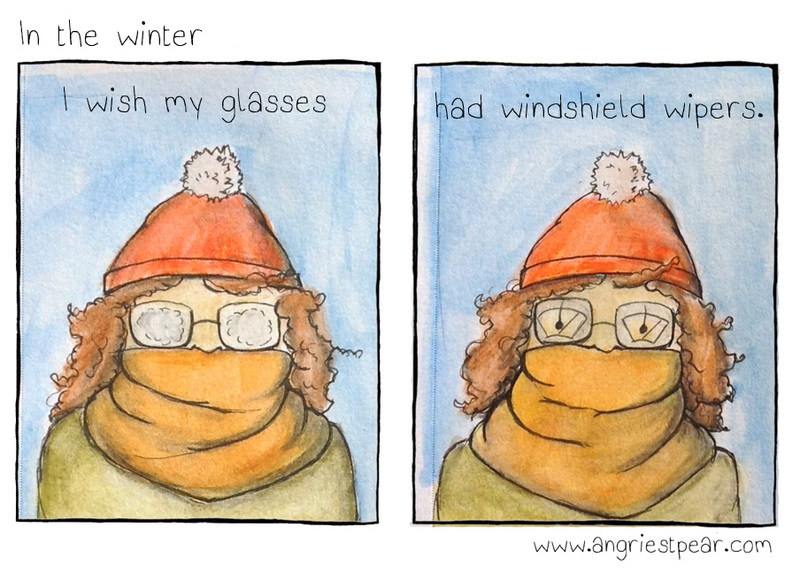 Wearing glasses in the winter is annoying. Categories: angry pear, Not Pear | Tags: cartoon, comic, fogged glasses, glasses, humor, illustration, windshield wipers, winter | Permalink. Thanks so much, Kate. I really really appreciate your kind remarks and that you like what I’m doing here with pears (especially the social media icons)! I also really LOVE your idea of adding a hidden pear somewhere in the illustration. I am going to steal that, absolutely! Oh so do I! Somebody should invent them immediately. Your illustrations are so delightful that I can’t believe anyone would worry if they’re not always seeing pear thoughts. Hahaha. Did you actually make them? I feel like in practice they would, as you are saying, be pretty terrible. But I still always wish for them every extremely cold day! i like this expanding of the empire! Thank you! 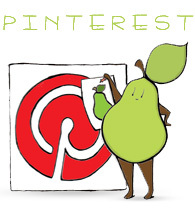 I like the idea of an empire… Pear empire… Pear overlords!!! Brilliant and completely sums up how I feel! The very wish of each and every glasses wearer. Thank you! I knew others would relate to this… the frustration and the blindness! Still, it could be considered a pear of glasses…?